Launched in May 2015, JobKiwi's mission is to connect people with jobs and change people’s lives through better careers. We are an independent website and this allows us to be adaptable to your requests and needs. For job seekers, we help you find your next job opportunity that matches your requirements, and what you need to do to successfully pursue it. For employers, we help you to find and attract the best talent in a competitive market. Improving the value we provide to our customers it’s a never-ending process, so we continue to seek for strategic ways to extend our offerings. We have the processes and technology to offer the highest level of service and support. At JobKiwi, we don't just deliver services, we help promote better lives. We know that getting the right job or finding the right candidate isn’t an ending, it’s the beginning of something great. 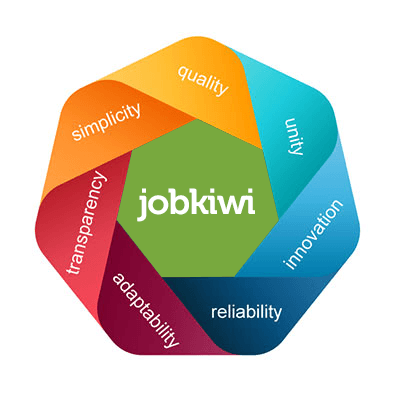 JobKiwi's mission, values, and vision are at the core of everything we do. Who we are matters and that is something we take very seriously. Our values are a timeless set of guiding principles that keep us focused on the right direction, influencing the way we work with each other and the way we serve our customers. Our vision is to be the customer’s First Choice in online recruitment and career services, using innovative technology solutions to provide our customers with the tools that will make them successful.